JAM Application Form 2019 – IIT Kharagpur has closed the correction window for the JAM 2019 application form. Candidates who needed to make changes in the exam centre or gender and category could do the same before October 30, 2018. Candidates who had to add a test paper or change a test paper could also make the necessary changes within the window provided. IIT Kharagpur had closed the application form window for JAM 2019 on October 12, 2018. Those candidates who have enrolled already can complete the submission of their application form of JAM 2019 by October 15, 2018. The JAM application form 2019 was released in online mode. Before filling the IIT JAM 2019 application form, candidates had to complete the registration process which was the first step of the application procedure. While completing the registration process candidates had to provide a valid email-ID and password, name and mobile number. After the registration process of JAM is completed candidates must use the enrollment ID and password created during the registration process to login and fill the application form. In IIT JAM 2019 Application Form, candidates had have to fill details such as candidates' personal details and academic details. JAM 2019 will be conducted on February 10, 2019 in online mode. In this article candidates can find the details steps to be followed while filling the application form along with the information regarding the documents to be uploaded, application fees, etc. For Exam Centre change: Candidates who wish to change their exam centre must note that a request for a change in exam centre within the same city/Town will not be permitted. Although under exceptional circumstances, a change of centre city/town can be permitted provided the candidate puts in a request with a valid reason to the below-given address before October 30, 2018. Group 2 consists of All others belonging to General and OBC categories. Application Form Status: The application forms of JAM 2019 are under scrutiny. Candidates whose application forms need to be rectified for Photograph/signature/other supporting documents will be contacted by the university via e-mail/SMS. The scrutiny process will continue even after the online application portal closes. Before sitting to fill the application form, candidates must make sure to have the following documents in hand to avoid any hassles. The photograph must match with the appearance of the candidate on the day of the examination. A passport size (3.5 cm Width × 4.5 cm Height) photograph of the face of the candidate is required to be uploaded with the JAM 2019 application form. The photograph must be in colour and taken after 01 August 2018 in a professional studio. Photographs taken using a mobile phone and other self-composed portraits may result in the rejection of application. Request photo studio to provide the image of your photo in a JPEG format and also on a standard 3.5 cm × 4.5 cm (Width × Height) print. Minimum pixel size of the JPEG image can be 240×320. File size of the image should be in the range of 5KB to 200KB. Background of the photograph must be white or a very light colour. The face should occupy at least 50 percent of the area of the photograph with a full-face view looking into the camera directly. If the candidate normally wear spectacles, a photograph with glare on glasses is not acceptable in the photo. While the candidate may wear spectacles for the photo shoot, if glare cannot be avoided, then it is advised remove the spectacles. Candidates must not wear spectacles with dark or tinted glasses, only clear glasses are permitted. Poor quality of the photograph submitted will lead to rejection of your JAM application, without any refund of the application fee. Candidates are required to draw a rectangular box of size 2 cm × 7 cm (Height × Width) on a white paper. Sign with black or dark blue ink pen inside this box. A signature with all Capital Letters, Initials or in any other color (other than black and blue) shall not be accepted. Get the digital image of the rectangular box (with your signature inside) scanned. Candidates must note that only JPEG image format will be accepted. The maximum image size of the signature should be 160×560 in pixels. The minimum image size of the signature should be 80×280 in pixels. File size of the image should be in the range of 5 KB to 100 KB. 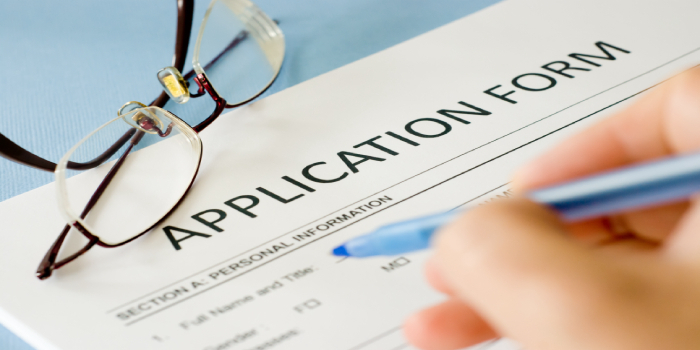 The steps to fill JAM application form 2019 will help candidates clear any doubts they encounter while filling the application form. Each step will explain in detail the procedure to be followed. First login using the enrollment id and password created after the registration process. Here candidates need to fill in their name, date of birth, permanent and present address etc. After filling the personal details candidates now have to give their exam preference which includes, subject and exam centre. Candidates must note that they can choose two subjects that they wish to appear for. Candidates must make sure that both the exams will be conducted in two separate sessions. While choosing the exam centre candidates must make sure that their choice of exam centre is closest to home. Candidates can choose up to three exam centre preferences. In this section, candidates will have to fill in the details of their qualifying examination. After all the sections of the application form are duly filled candidates can move on to the application fee payment process. Before completing the payment process candidates must make sure to check the details entered in each of the sections as there won't be a chance to correct the details once the fee payment is complete. Here candidates can find different payment options which include Debit/Credit Card or Net banking. After choosing the payment option you can now proceed to pay the application fee. After the payment is done a confirmation will appear stating the fee payment has been completed. What after JAM Application Form 2019? IIT Kharagpur will not provide a correction window for candidates to make the necessary correction in their submitted application form. Thus they must make sure that the information that they enter in the application form is correct. After completing the Application form candidates can download the admit card which will be released on January 8, 2019. Candidates will get the details regarding the exam centre and session and timing of exam in the admit card only. JAM Application Form 2019 – FAQs? Question: How to pay the JAM 2019 Admission Form fee? Answer: Candidates could make the Admission Form fee payment only online. Payment can be made using credit/ debit/ net banking through the payment gateway. Extra charges, depending on the mode of payment, will be added to the admission fee during payment. The Application fee for admission is non-refundable. Question: Which Documents will not be accepted under Nationality? Ration Card, Bank Passbook, Mark-sheet, PAN Card, Driving License, School/ College ID etc. Question: What should be uploaded in the Qualifying Degree certificate field? Answer: Candidates need to upload their Degree/Provisional Certificate in this section.